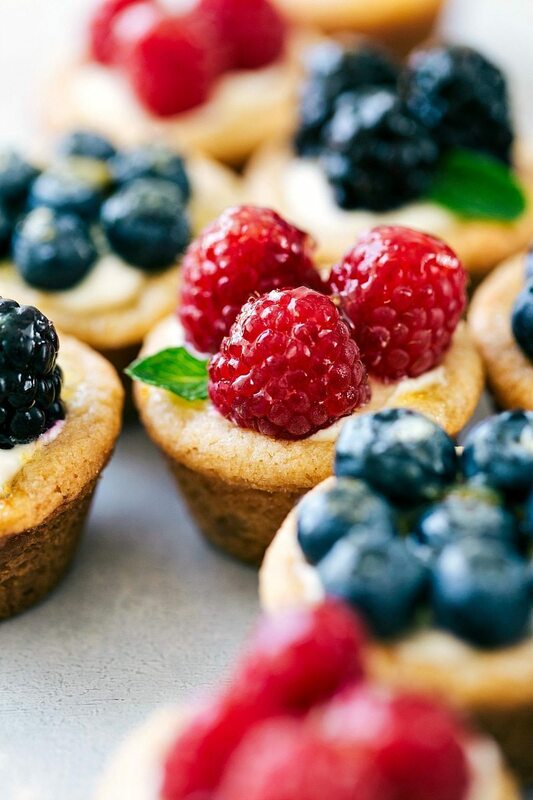 Fruit tarts. 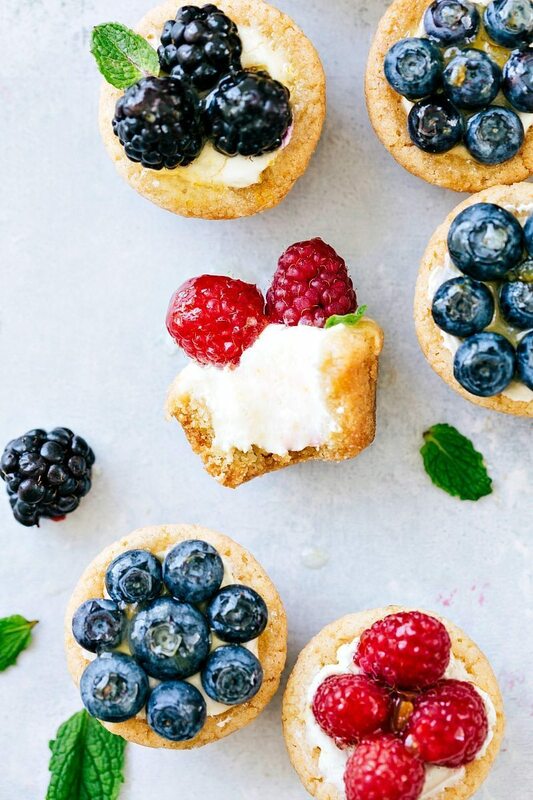 A delicious cream cheese mixture fills a miniature sugar cookie cup and is topped with glazed fruit. Who can say no to that? With Mother’s Day coming up I wanted to create an extra-special treat I could surprise my mom with this year. And lucky for me, these delicious fruit tarts are the perfect solution to my problem! Not only do they taste incredible, but they are beautiful! Just look at the color of all the berries. Yum! I LOVE this fruit tart recipe. Not just because it’s SO GOOD, but also because of how easy it is to make! 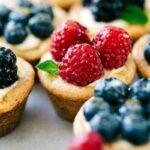 When you are making this fruit tart recipe, there are a few tips to make sure they come out the right size and can be easily removed from the muffin tin. Grease the muffin tin really well. I also like to put a little bit of flour on top of the greasing just to help with the removal of the fruit tart. Remove the cookies from the muffin tin almost immediately. Remove the cookies from the oven, press in the centers (I use the back of a teaspoon or 1/2 teaspoon measuring spoon), and then immediately begin working to get them out. I work around the cookies with a butter knife, and slowly coax them out with a spoon. In my experience, the longer I wait to pull out the cookies from the muffin tin, the worse they come out. If they “harden” or cool in the muffin tin, they are near impossible to pull out in one piece. Okay, your mom is so ready to enjoy these on her day already! Once they are out, further indent the center. Let cool most of the way and then place in a large Zip-loc bag and seal the bag. This retains a tiny bit of the heat and keeps these cookies ultra-soft. Beat the cream cheese until soft and creamy (make sure it is softened first.) Beat in the sour cream, the juice + zest, vanilla extract, and orange extract if desired. Place in the fridge for at least 25 minutes. Spoon the filling into the sugar cookie cups. Place fruit of choice on top. Combine the jam and water in a small microwave safe bowl and microwave for 15 seconds. With a pastry brush, brush the jam over the top of the tart. Read the tips in the last paragraph for best results! I tried to scatter them throughout the instructions, but they are in greater depth there. I love these Chelsea! It’s an awesome idea and I so want one right now! How sweet are these? So cute Chelsea! And I’m glad your starting Mother’s Day early so I can send my readers over here. I haven’t even started yet! Haha! These tiny bites look adorable and I’m sure they taste delicious! These are so cute! Great idea for Mother’s Day. Thanks for the tips, too, Chelsea. They really help. I LOVE iced sugar cookie so much. These are so cute, too! What a great Mother’s Day treat, Chelsea! Can’t wait to see what else you have planned! That filling!!! I’m dying with how good it looks!